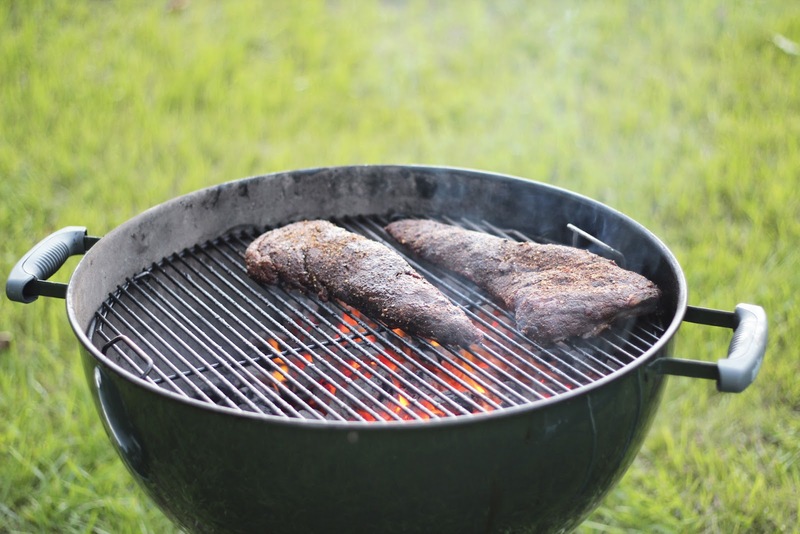 Jake has been talking about bringing a tri-tip steak home to grill all summer - easier said than done. Each steer only has two tri-tips and it's an elusive cut in the north-east, so they generally don't last long in the case. Like other one- or two-to-an-animal cuts (skirt, flank, and hanger) Jake had resigned himself to going yet another summer without one. 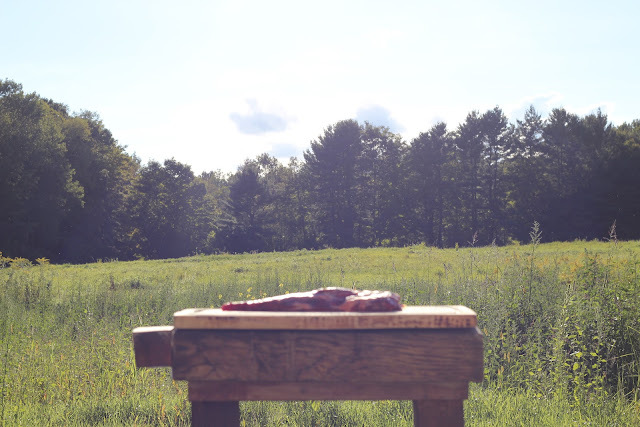 But last weekend The Meat Market had a few too many of this much-coveted cut and Jake was finally able to sneak a couple home! The tri-tip is a incredibly flavorful and unique cut, but because it's a muscle that starts in one primal (the loin) and ends in the other (the round) it is usually forfeited at the hands of industrial meat processing. It is also a part of the sirloin subprimal, sometimes referred to as the bottom sirloin. As a result of this cross-sectioning of cuts, the tri-tip cooks like a roast as much as it does a steak, giving you a ton of different preparation options. We think it's the best of three pretty awesome worlds; the texture of a flank, the tenderness of a sirloin, and the flavor of the top round. 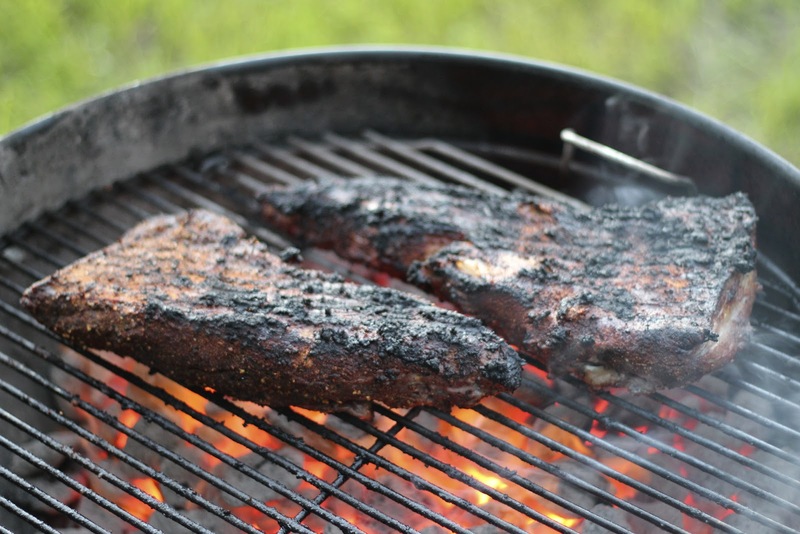 Made popular in central California at the turn of the 20th century, the tri-tip is most often cooked in the Santa Maria style - coated in a dry rub and grilled. 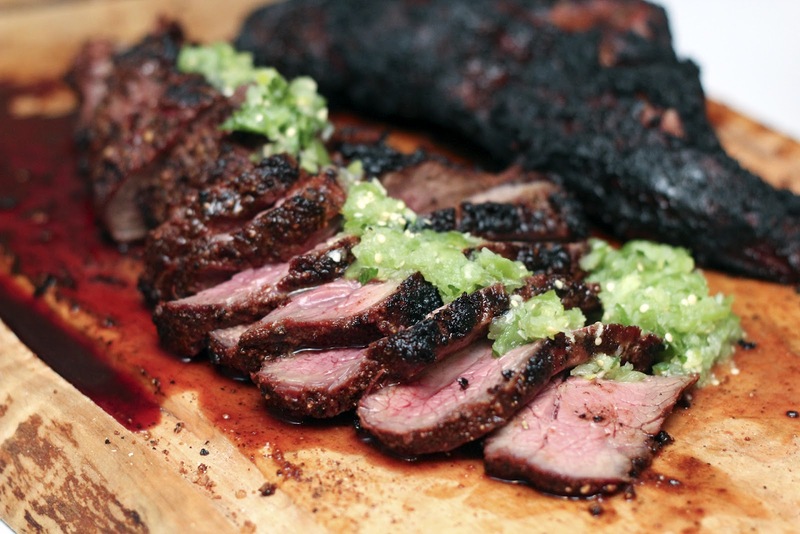 As you well know, we generally like to keep our steaks as simple as possible, but the flavor of the tri-tip is bold so we knew it would stand up to a heavy rub. We looked around for various recipes but in the end, surprised by how few there were, we put our own mix together. While the spices were setting in, Silka threw together a minimal salsa verde with a pile of tomatillos from our garden. It may have been one of our last nights of grilling this season, and we couldn't have asked for a better send-off! 1. Mix all of the spices together thoroughly. 2. Rub the spice mix all over the steaks. 3. Let the steaks stand for two hours, reapply any rub left over. 4. Meanwhile set up your grill so that there is a very hot side and a side for indirect heat. 5. On the hot side of the grill sear the steaks on each side for 3 mintues. 6. Move the steaks to indirect heat and cover the grill. Cook for another 15-20 minutes, or until the steak reaches 120 f.
7. Let stand for 10 minutes, slice and serve!